Consort music of Christopher Tye, Dowland’s Book 2, and a lovely program from Nigel North . I. In Nomine—Works for Recorder Consort (Boreas Quartett Bremen/Hans Tol). CPO CD 777 897-2. 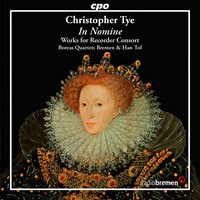 Named after the god of the north wind, the recorder quartet Boreas Quartet Bremen’s superb technique, perfect intonation, and incredible precision led by Han Tol are perfect partners with this selection of works from the collection In Nomine by English Renaissance composers Christopher Tye and John Taverner. Composed with a breadth of character and style, the In Nomine pieces were unique for their time with the manuscript formatted in a way that it wasn’t placed on a music stand, but rather on and read from a flat surface. This along with the score being readable depending on the musician’s proximity to it led to a manner of performing necessitating a closed circle seating of smaller and more intimate dimensions. Luminously detailed readings by Boreas who also play recorders based on copies of original instruments by the famed instrument building Schnitzer family of Nuremberg for this recording. II. John Dowland: The Second Booke of Songs or Ayres (1600) (Maria Skiba/Frank Pschichholz). DUX CD 1192. John Dowland, of English or possibly Irish origin, was born in 1563, probably in London. He was a lutenist of distinction but failed, allegedly because he was a Catholic, to win a position in the royal service, and therefore sought his fortune abroad at Kassel and later, in 1598, at the court of Christian IV of Denmark. He was forced by debt to return to England in 1606 and eventually won appointment as one of the King’s Lutes in 1612. He performed during the funeral ceremonies of King James I and ironically dying the following year. Dowland was the composer, in particular, of one of the best-known songs of the period, Flow, my teares, music much imitated and epitomising the fashionable humour of the day - melancholy. III. 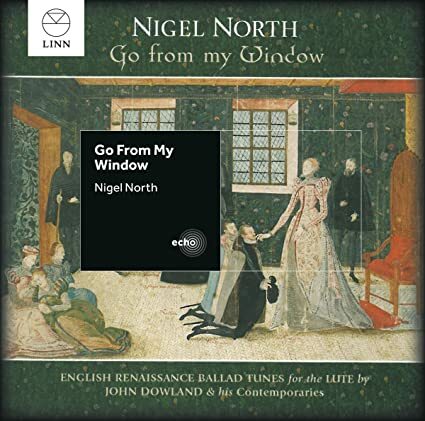 Nigel North—Go from my Window (Nigel North). Linn CD BKD 176. Nigel North has an unrivalled reputation as a lutenist. His style merges impeccable technique with a jazz-like improvisational ability, which makes repertoire like Dowland ideal. The great lutenist composers of the sixteenth century were masters of improvisation, but, of course, we have no concrete evidence of the forms that these improvisations took. 'The versions that are handed down to us in lute tablature are often so well worked out and complicated that they may represent a parallel track to the improvised version which we will never hear!' says North. CPO CD 777 897-2, DUX CD 1192, Linn CD BK 176.